From the land of lobsters and a certain well-known horror novelist arrives a death metal demo fully living up to its ‘progressive’ tag. Now I’ll freely admit it: most often, death metal technically-executed leaves me cold due its adherence to self-aggrandizing self-abuse. 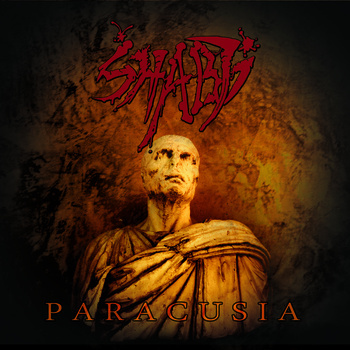 Expecting this feeling once more, my first listen to Paracusia was a bit half-hearted, but after a second spin, I found myself mouth agape – Shabti had successfully shot down my preconceptions. Overflowing with riffs that have structural difficulty (without any Racer X-style solos), Paracusia remains an album of songs, not Berklee-trained boredom. The mid-range sound of the guitars snarl in and out of pure death metal, thrash, and black metal atonality, but flow from one section to another in a manner that always makes sense and keeps you attuned to the composition beneath the performances. Ray Capizzo’s (also of Falls of Rauros) drums deftly snap on and around the attack of guitarist (and vocalist) Rob Cook, but don’t follow Cook’s riffs explicity – ample room given for intriguing snare hits and quick fills adds color to his playing and intimates a knowledge of percussion beyond just pounding. And the ever-present, ever-distorted fretwork of bassist Denis Lausier pulls it all together by doing what a bass player should – filling the gap between drums and six-string by strewing about counterpoints, octaves, and impressive (but not masturbatory) runs between the madness. Imagine a head-on collision of Absu’s 2009 self-titled album and StarGazer’s A Great Work of Ages, and you’ll have an idea of what we have here. ~ by cliftonium on March 5, 2014. This entry was posted on March 5, 2014 at 8:55 pm and is filed under ALL REVIEWS, S-reviews.You can follow any responses to this entry through the RSS 2.0 feed.You can leave a response, or trackback from your own site.